It's been a magnificent year of music for young people, offering extra performance opportunities, and support to schools which are actively increasing their range of musical activities. This great performance has demonstrated how much young people in Hampshire value and enjoy their musical education. I am very pleased to have been able to support that while I was Chairman last year, and hope that we have inspired many of our schools to continue with their extended musical programmes. Well done to all the performers. It is fantastic to see such a range of ages and abilities engaging with music and getting so much enjoyment and fulfilment from it. The 'Year of Music' was available to schools across Hampshire, and the majority joined in with some, or all the activities. The programme provided extra musical events organised by Hampshire Music Service; encouraged schools to increase their musical activities, by providing a schools' award scheme; and gave young musicians a voice in the decisions that affect musical learning in Hampshire, with the launch of a 'Youth Forum'. The Schools' Award Scheme enabled schools to log their musical activities and receive certificates for milestones, school concerts, and for recognising pupils' individual achievements. We believe that music is a powerful, unique form of communication. It can change the way pupils feel about themselves, giving them confidence and building their self-esteem. 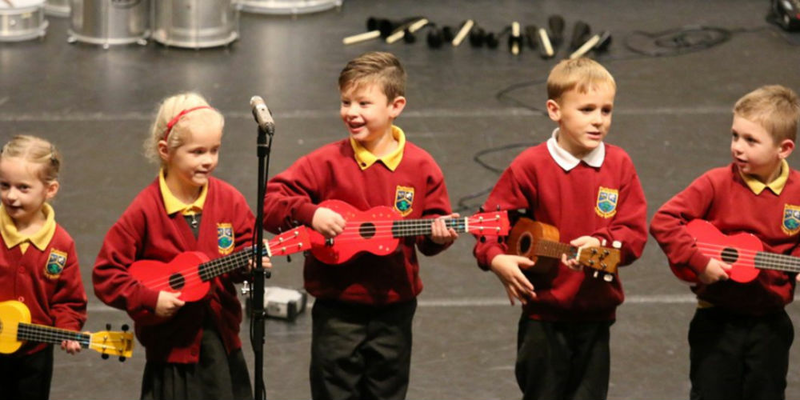 Giving children the opportunity to perform, inspires a love of music. Using the platform of the Chairman's Year of Music has raised the school community's enthusiasm to celebrate and 'sing out'. Indeed, the school has never had so many pupils wanting to sing in the school choir. The final Celebration Event on Thursday 19 October at Thornden Hall, Chandler's Ford, was attended by Keith Chapman MBE and the current Chairman of Hampshire County Council, Councillor Graham Burgess. It included presentations to the top achievers and musical performances from eight schools across the county, of varied age groups, styles and disciplines (listed below). The event was hosted by Youth Forum members, who are also members of the Gosport and Fareham Youth Orchestra and the Portchester, Fareham and Gosport Youth Band. The finale was a massed choir performance of Crescent Moon by The Crescent Primary School. This school applied successfully for Chairman's Year of Music funding, to purchase a PA system. With this they created Crescent Moon, their new school song (available on Spotify). All schools and the audience joined in the finale.